Spring has arrived, and we have been spending more time outside, making dinner on the grill, and getting our garden area ready for our soon-to-be vegetable garden! As I am a million months pregnant, and can’t do much in the way of manual labor right now, my husband has been doing all of the heavy lifting. I truly appreciate all of his efforts, so I decided to make one of his favorite drinks to cool off with: peach iced tea. He usually drinks the Arizona Peach Iced Tea out of a can, but I figured it would taste better and be a little healthier to make it at home. I also happened to find fresh peaches at the grocery store this week, so it was perfect timing! 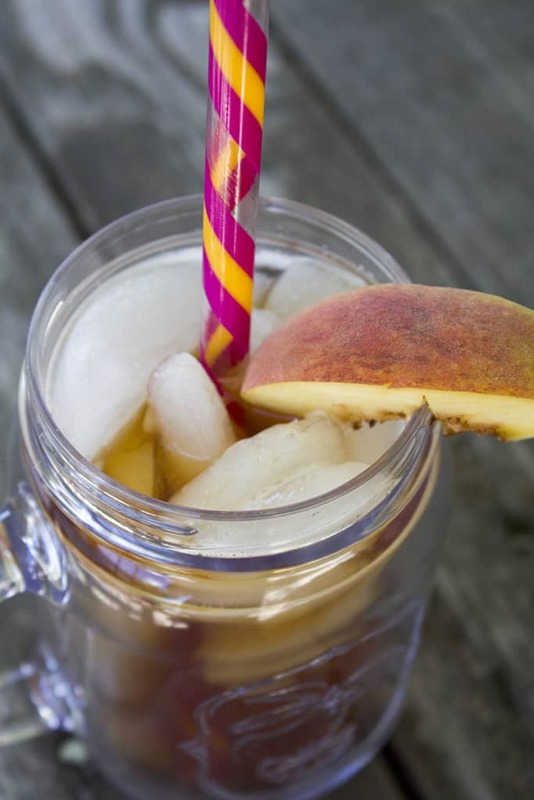 This recipe is super simple… it just consists of creating a simple syrup infused with fresh peaches, and adding it to some freshly brewed iced tea. It takes about an hour, start to finish, but requires very little active “cooking” time. In a small saucepan, bring sugar, water and peaches to a boil. Allow to simmer 10 – 15 minutes, stirring often, until peaches have softened. Use a spoon or potato masher to mash the peaches into the syrup. Turn the heat off, and allow to infuse for another 45 minutes. Meanwhile, bring 4 cups of water to a boil. Place tea bags in a large pitcher, and pour boiling water over tea bags. Allow to brew 5 minutes (or until desired potency), and remove the tea bags. Strain the syrup into the tea mixture, separating out the peaches. * Add 6 cups of ice cubes to the tea mixture, and give it a good stir. Refrigerate, adding more ice if necessary. *I saved the peaches, and put it in top of ice cream after dinner! That’s it! 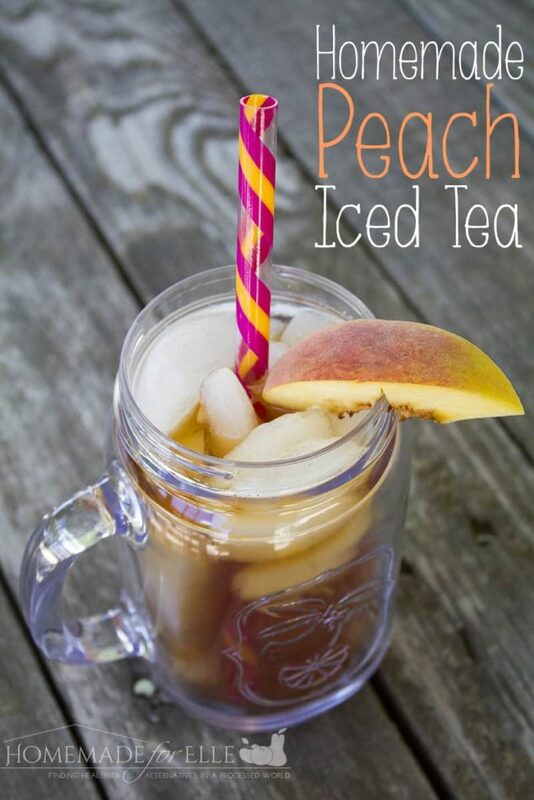 You can have homemade peach iced tea in just a few minutes worth of labor, and a little more waiting time. Perfect for a hot, spring or summer day! This tea sounds really good. Peaches and summer go hand in hand. I love that you saved the peach pulp for ice cream – such a frugal idea! I have made blackberry tea but never peach. Can’t wait to see fresh peaches in the markets. I’m not much a tea drinker but I like to be able to offer it to guests. Peach iced tea is just that much more special for a guest.